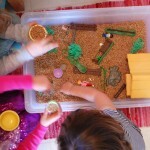 Does your toddler enjoy squishing play dough, scooping rice, or dumping buckets of sand? 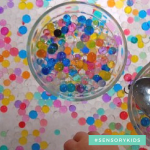 It’s widely recognized (read here and here) that sensory activities play a central role in infant and child brain development. 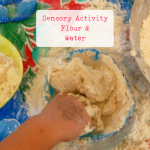 This is one of those amazing activities that just “happened,” invented by a toddler who was curious about the combination of paper and water, and could be easily replicated in a home or school. 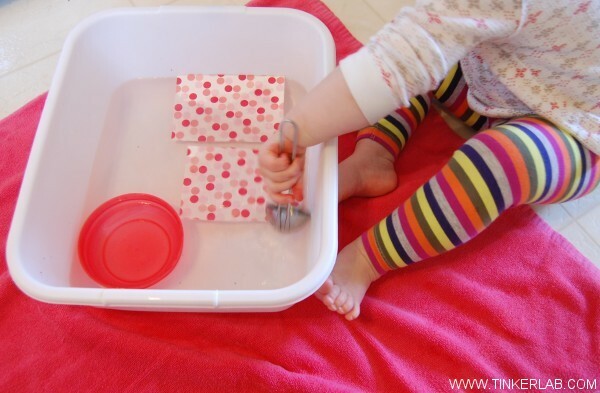 I placed a towel on the kitchen floor, and filled a tub of water with a small bowl and ladle for water play. My three year old was building things in the other room with paper, and little R toddled and selected these two pieces of polka dot paper. Pretty. But that wasn’t enough, apparently. 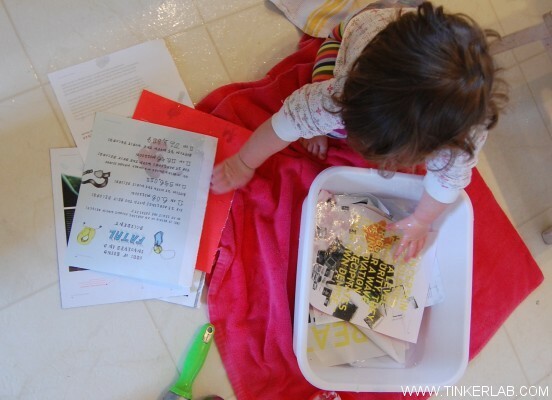 She kept walking back and forth, grabbing small handfuls of paper to fill her tub. 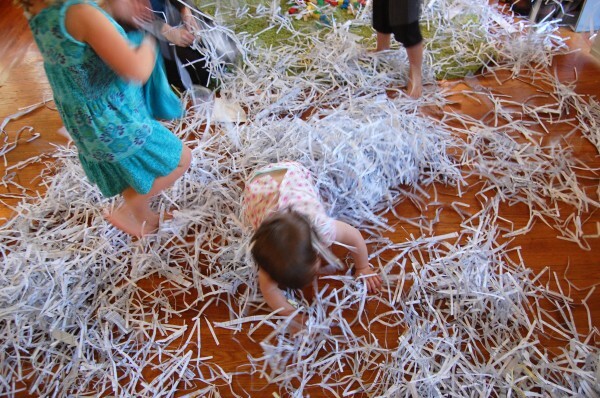 It seemed that the challenge was to gather paper and squash it as deep into the water as possible. I thought I’d help her out a bit when I noticed the slippery trail of water from the kitchen to the dining room. And then I foraged the recycling bin and tore this magazine apart for her. She finally sat down to work through the big magazine pile, happily engrossed in this meaningful activity. 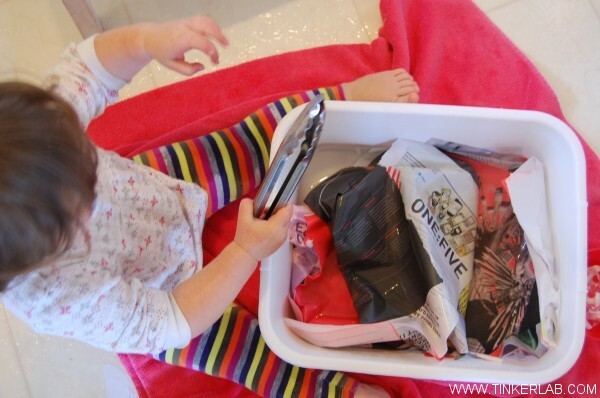 As a last step, I handed her a pair of kitchen tongs for picking up pieces of paper. 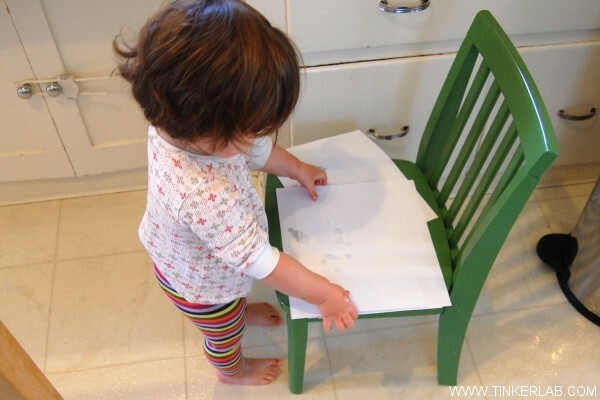 She’s not quite ready to use them for picking objects up, but she enjoyed snapping them and poking at the paper. And just so you don’t think this all went to waste, it inspired me to turn the soggy paper mess into a paper-making project the next day. Stay tuned for that! Loved the post. 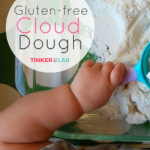 Will try it with Sarah soon and let you know her reaction :).Â Thanks for sharing. Yes! And thank you for letting me know how the wet paper goes with Sarah. So curious! 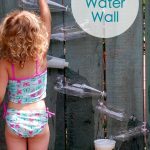 My daughter loves water play.Â Definitely adding paper to the mix.Â She will just love this. You never know, Margaret! If you have a chance, please circle back and let me know how it goes. Me too, Vicky. Thanks for the comment! I did something similar with my son when he was 2. 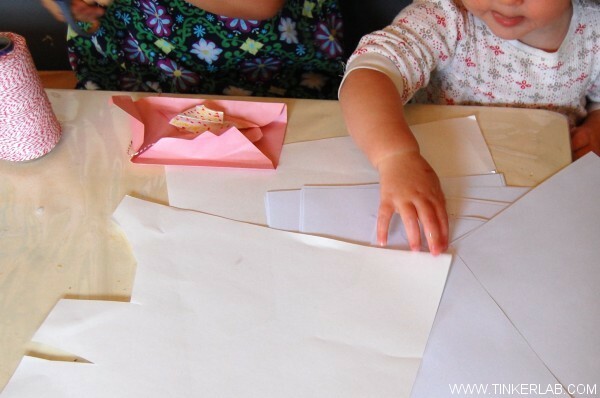 I include different types of paper (tissue, toilet, cardboard, paper towel, etc). It was great and I could refer back to it when I cautioned him to not get books, etc. wet…He new first hand what would happen 😉 I need to do this again for my daughters, they love water! Now isn’t that a great perspective, Melisa?! 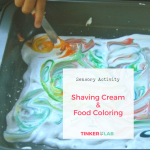 I hadn’t considered the cautionary tale that’s embedded in this activity and I’m sure I’ll have many chances to refer to this as well! Thanks for the idea. 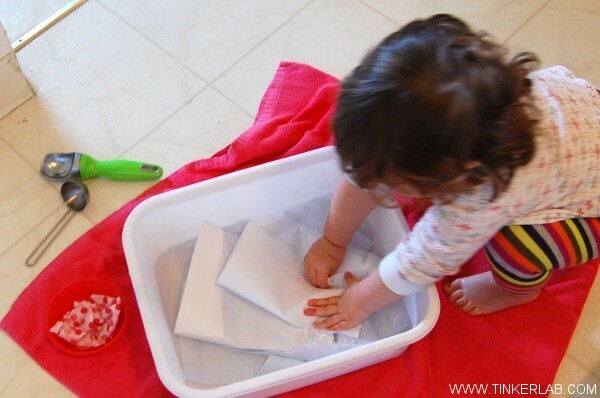 Baby R would enjoy the process of paper making with recycled papers. And that’s just what we did the next day, Melissa! 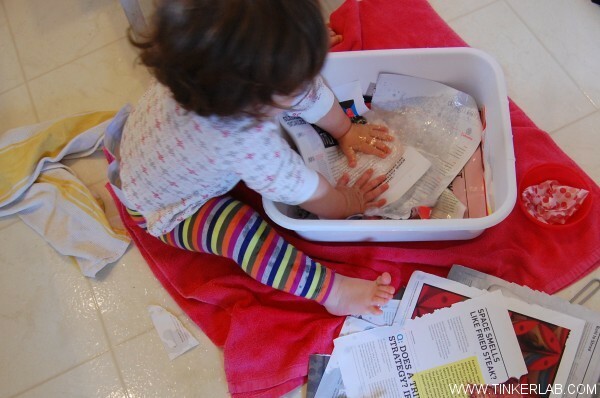 She loved squishing the paper pulp (and I did too). 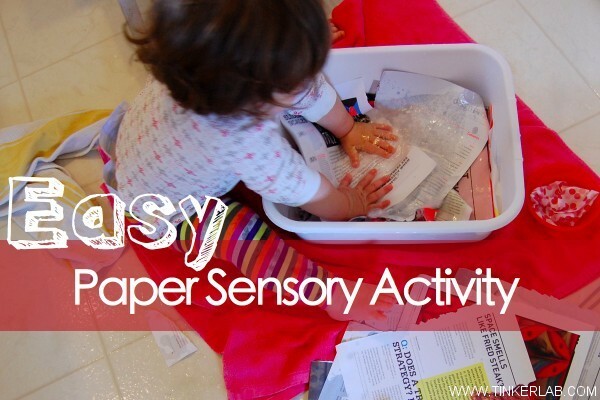 I never thought of trying wet paper sensory! I wouldn’t have thought of that either, Deborah! That’s what’s so awesome about following the lead of our kids, isn’t it? Funny that you posted this today.Â I’ve been doing a paper mache project with my toddler.Â It’s wet paper + sticky and gooey.Â He loves it! It must be paper season, Stef! Feel free to attach a photo of your work in progress or completed project to a comment or my Facebook page if you’d like — I love getting inspired by my readers! I love that you let her lead the way on this project. This sounds like a lot of fun. You know, I almost always (maybe always) encourage my kids to take the lead. It’s a sure way to help them find their own voice and develop confidence in their decision-making. Well, that’s my hope anyway! I work at a daycare, and I have five toddlers (15- 20 months) and I have the class by myself for the first time. Looking for nice ideas for my lesson plans. and I really love this. The kids love to feel on things. Thanks for the ideas. 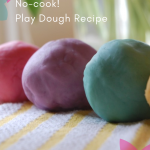 I tried this out with my 18 month old twins. Maybe they are still too young, because it only lasted a few minutes. When I tried to show them about getting the paper wet, they just wanted to get it out of the water ASAP. Within minutes they just dumped the water all over (thank goodness I laid out all of those towels). Maybe I need to try again in a few months.